In this episode, hear how psychologist and professor Dr. Shannan Crawford got free from self-criticism and self-hatred after working through the sexual abuse in her childhood, with the help of the Holy Spirit. Learn about how we can all experience the healing of the Counselor. Listen to how wounds from your childhood might be impacting you now and how we can bring it into the light of God's healing. Dr. Shannan shows us to come out of shame and addictions, related to our wounds, to be truly alive, and experience real freedom and joy. Dr. Shannan Crawford is a Clinical Psychologist in Keller, Texas and she is Faculty at King's University. Feel stuck & left out? Everything is about to change! God is calling women to new purpose and new places of leadership. And who is He calling? He is calling those who feel bone dry and weary, who have felt left out and rejected, who have felt anxious and looked over, and who have felt like misfits. Beloved, He is causing old dreams that seem dead to come alive in fruitfulness now. She was married to a workaholic who neglected her until he finally Saw Her and changed! Are you married to a workaholic or someone that is neglectful? Do you want to leave, but believe God wants you to stay? Are you tired of waiting for your breakthrough? Or…are you out of balance yourself, putting work before your relationships? Either way, This Podcast Was Made for You! Charmin Koenig is married to a world-renowned scientist, the head of his field. As he received worldwide accolades for his research, she suffered decades of neglect and depression and lived like a single parent...But then, God opened Dr. Harold Koenig's eyes and heart to his wife. Now everything has changed for these two love birds! Listen and receive your relationship miracle now! Do you suspect that you have been called to something great, but feel your life is too messy right now for your purpose to truly come forth? 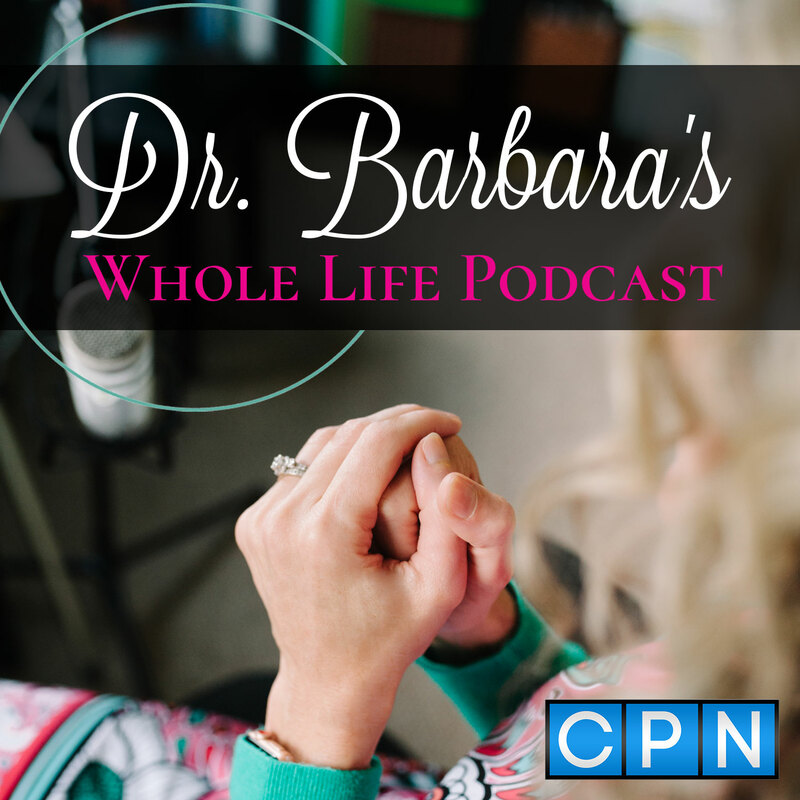 Listen as Dr. Barbara shares a fresh and powerful message on how to move out of being bogged down, stuck, and/or confused and into your own unique purpose, with joy! How to Relax anytime, anywhere, without indulging in excesses. Do you frequently struggle with anxiety? Do you sometimes feel overwhelmed? You are alone...so many of us struggle in these areas! Women are, in many ways, socialized to worry our lives away. Then to cope with the adverse impact of worry, we often turn to overeating, over-drinking, over-controlling and other excesses. TRUTH: We all need concrete skills in relaxation. In the podcast, Dr. Barbara teaches you how to relax, anytime, and anywhere. If you would like more help with reducing anxiety and increasing relaxation get The Hearts Returning Home course at HeartsReturningHome. com. You are ambitious, you are "gettin' it done", but is your soul well? As ambitious women, we pride ourselves on getting all done. But sometimes, our "get 'er done" is moving too fast and we need to slow down to hear what God is doing and saying...so healing can happen. Hear how spiritual powerhouse, author, and podcaster Mimika Cooney learned how to move from worrier to warrior, and from holding it all together, to gaining a greater revelation of how God Is Holding Her! Enjoy, beloved! Are you struggling with how to set boundaries in your relationships? Do you have a hard time showing up for yourself? Do you feel like you lose your voice or that others do not really hear or respond to the real you? In my clinic and through social media, many women ask me for help in this area. In this episode, I take you through a quick Boundaries Boot Camp to help you understand and set better boundaries. Be ready to drink in more freedom and confidence, my friend! If you would like more on boundaries, The Hearts Returning Home course is now available www. HeartsReturningHome.com. Learn how your present struggles could be linked to your past, and how to heal and transform! Dr. Heather Davediuk Gingrich, author, professor, and Christian counselor shares with us how the past can often be present and gives us hope for how to heal from the wounds of our past. Dr. Gingrich and Dr. Barbara explain the 3-stage model of trauma healing, and how to work through trauma while still staying functional and balanced in life. Dr. Gingrich also explains how to choose a good counselor. Trauma is all around us, and much more present in many of our lives than we are usually aware of. This is a must listen to podcast regarding what the process of healing from traumas looks like. You will find real hope for your soul and the souls around you! Learn how the POWER OF KINDNESS and BOLDNESS has transformed the life of THE Social Media Kindness Queen, Carry Grace! Carry Grace has the ministry of kindness, and the Lord has placed her on center stage after her act of kindness on an airplane on went viral on social media! Learn about the power of kindness through Carry Grace's amazing storytelling, and grow in Boldness as you both Share and Receive More Kindness! Find out how you are blocking your own flow to more kindness and goodness in your life and what to do about it. This is a must Listen, Feel-Good podcast! Best-selling Author, Researcher and Relationship Specialist shares how we can reduce the impact of stress on our Love Relationships. It is February, so we are continuing to look at how to make love work! You will be so thankful that Shaunti Feldman does not tell us to slow down. Instead, she looks to research and scripture and shares that we can live out of our passions in our careers/ministries while still having delightful marriages. You Must Listen To This One as Shaunti helps us to overcome stress and make our marriages better while still living fulfilling, and even ambitious, yet prioritized lives. She also shares her "secrets to a happy marriages" that promise to deliver. Listen and be transformed in your soul and relationships! Listen to tools that will make your love relationship work! Whether you are in a relationship or want to be in one, we all need tools to make love great. In this episode, couples therapist, Lauren Bowman LMFTA, LPCA, shares tools with us for how to make relationships work! She shares her personal story of marriage transformation through spiritual transformation. She also shares how to overcome common marriage challenges, such as spiritual mismatch, and dealing with past childhood wounds that are impacting the marriage. Don't miss this one! Many women find themselves continually trying to break free from emotionally destructive relationships only to find themselves in new destructive relationships. Why is this, and what can we do about it? What do we do if the person who is demeaning and emotionally abusing us is our spouse? Best-selling author and clinician, Leslie Vernick, MSW, shares with us how to really break free from destructive relationship dynamics. If you are feeling beaten down by relationships you suspect might be unhealthy, you Need This Podcast! In addition, this podcast will help those of us who want to help women in emotionally abusive relationships from a Christ-honoring point of view that will not perpetuate the abuse. From hurt to hope. A story that will encourage you to your core. Jesus truly rescued this English turned Australian women from depression, the effects of sexual abuse, father-less-ness, and a broken heart. S.J. Meeson has a powerful story of hope, which is weaved throughout her story. Just wait until you hear her authentically share what the Lord did for her. If Jesus did it for her, He Will Do It For you and Yours! Listen and be catapulted into heartfelt encouragement and greater faith. You can live without fear and in certainty! Ericka D. James shares with us how to live without fear and in amazingly powerful certainty. Imagine what your life would be like if you lived in certainty? Listen and learn how to hear directly from the Lord, and step out in faith, while being fully you and loving your life. This talk Will Change Your Life! It changed mine! Ericka shares about how she overcome "daddy issues," abandonment in love, being bullied and more. She really has a gift of faith that will be imparted to you as you listen. Don't miss out! How to stop being dragged down by the hurts from your childhood? Are you tired of moving from crisis to crisis? Do you live in too much overwhelm? Do you feel that your difficult childhood seems to be plotting against your best efforts to live a better adult life? Do you experience insecurities that you do not understand? If so, there is real Hope for you now! Listen and learn how to finally overcome those childhood stumbling blocks and finally be the free, confident, successful women you always dreamed you could be. Overcome body shame and be healthy. Do you judge your body? What would it be like to love your body? Learn how to move from body-shame to body-love while still being (imperfectly) healthy. Hear how Dr. Melody overcame her own body-shame and is now free to be herself while pursuing a moderately, enjoyable healthy life. God really did make you just right, just how you are. And you can radically love yourself while you nurture yourself with healthy habits. Listen and be transformed today, body, soul, and spirit! How can you follow your dreams of career or ministry when it doesn’t make sense? Dr. Barbar Low is excited for you to hear how Dr. Melody Stevens followed her dreams to have the ministry and career she dreamed of, even when it didn’t make sense. She worked hard for her doctoral degree in physical therapy. But her passion was to help the whole person, body soul, and spirit. Hear her journey of how God opened up amazing doors for her and turned the passion of her heart into a dream career and ministry. If she can do it, you can too! Need more stability and peace in your life? Is your life being dragged down by anxiety, insecurities, or feeling overwhelmed and blue? In this episode Dr Barbara continues to teach us how to R.E.S.O.U.R.C.E. our life with tool that really work to bring us more peace and stability. Moreover, these tools are effective in preparing the heart for the healing process God wants to take you through. Dr. Barbara shares her SELF-MOMMING TOOL which clients and followers rave! Listen now and learn how you can finally find relief and a sense of grounding that will bring you more emotional stability, improve how you feel, and help you have more success as you engage in all necessary adulting! Are you feeling weary from the struggle of living with your mind, emotions, and experiences? Is your life being dragged down by anxiety, insecurities, or feeling overwhelmed and blue? In this episode, Dr. Barbara teaches us how to RESOURCE our life with TOOLS THAT REALLY WORK to bring us more peace and stability. Moreover, these tools are effective in preparing the heart for the healing process God wants to take you through. Listen now and learn how you can finally find relief and a sense of grounding that will bring you more emotional stability, improve how you feel, and help you have more success as you engage in all that necessary adulting! Dr. Shannan is a healing powerhouse, and she does not disappoint in part 2 of the FROM ME TOO TO FREE TOO Podcast. Hear how Psychologist and Professor Dr. Shannan Crawford got free from self-harm and now helps others to get free! She also shares how healing from sexual abuse and childhood wounds occurs. Listen and Get Free! This is for you! Learn about how we can all experience the healing of THE Counselor so that you can be healthier and more functional to enjoy your life now! Dr. Shannan Crawford is a Clinical Psychologist in Keller Texas and she is Adjunct Faculty at King's University.